The Christmas Charity Tree 2015, with the theme “Magical Macaron Christmas”, is now beautifully lit up in the Main Lobby of the Shangri-La Hotel, Kuala Lumpur. 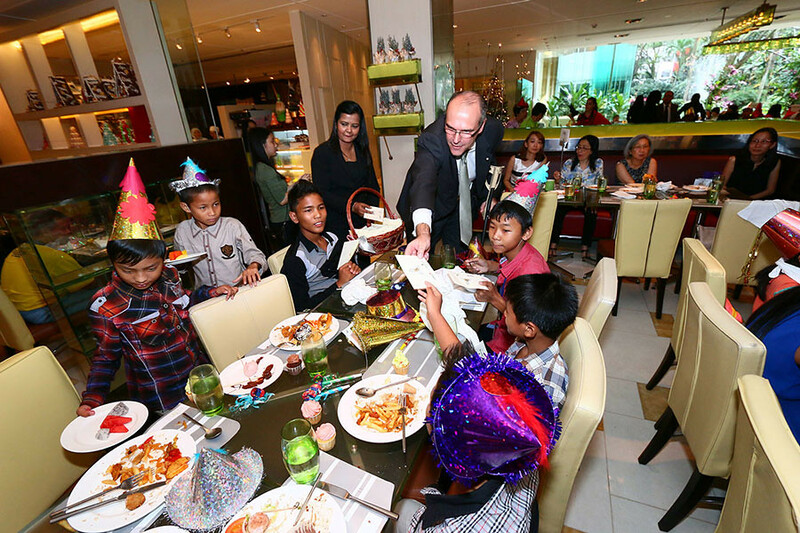 The lighting ceremony was performed on 2 December by the hotel’s Area General Manager Manfred Weber, assisted by some of the parents and children with serious heart ailments who will benefit from the funds raised from the tree. This year, the Christmas Charity Tree fund is for seven children who need urgent heart surgery for their life-threatening illness. Witnessing the lighting up of the Christmas Charity Tree were 120 disadvantaged children from Tasputra Perkim, Rumah Charis, Pusat Penjagaan Kanak-Kanak Cacat Taman Megah and UNHCR (United Nations High Commissioner for Refugees), and hotel guests. The Christmas Charity Tree is made up entirely of 200 miniature macaron trees stacked on 10 tiers of it, reaching a height of 21.5 feet. There is a total of 15,080 macarons on the tree, and every tier rotates. The miniature macaron trees are for sponsorship by donors, each for a minimum donation of RM1,000/- to raise funds for the seven children with severe heart ailments who need immediate surgery. The donors’ names or company logos will be prominently displayed against each miniature macaron tree. 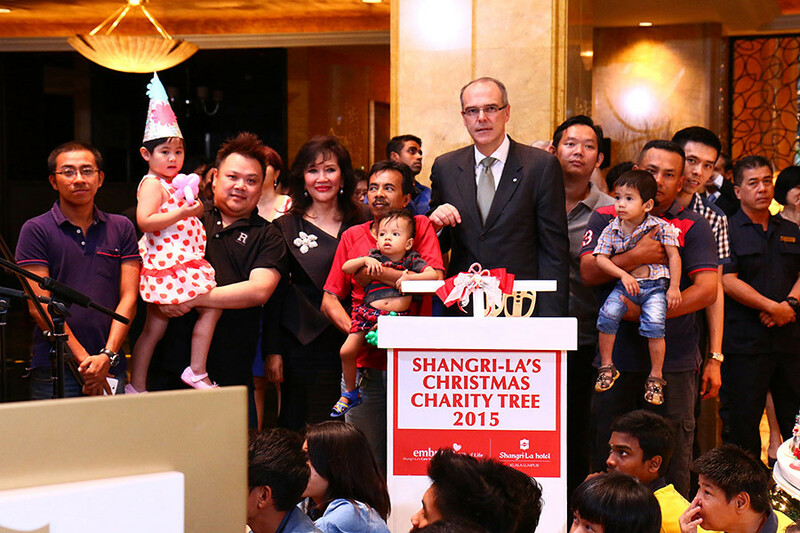 The Christmas Charity Tree is an annual charity project titled “Embrace the Gift of Life” initiated by the Shangri-La Hotel, Kuala Lumpur to aid children suffering from serious heart ailments and who need surgery. 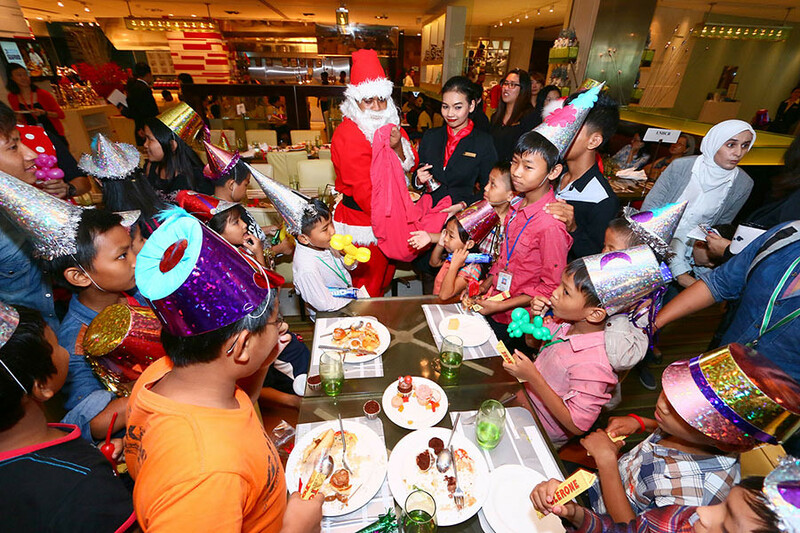 The lighting up of the tree was preceded by a tea party for the children, complete with Santa Claus, clown and balloons, at the hotel’s Lemon Garden Cafe. Mr Weber also distributed festive donations to all the children. 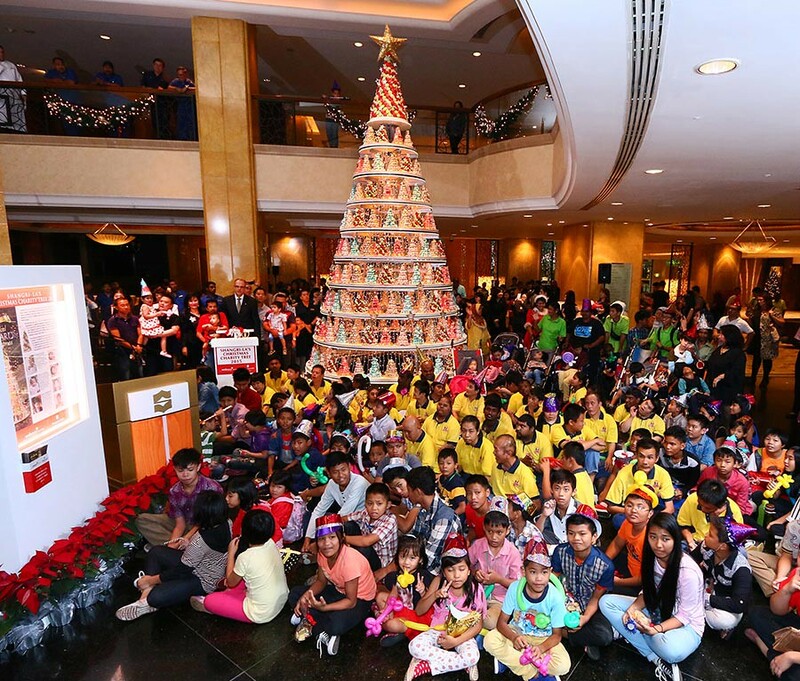 Since 1985, the hotel has helped hundreds of critically ill children and raised more than RM3 million through this Christmas Charity Tree. Shangri-La Hotels and Resorts remains committed to operating in an economically, socially and environmentally responsible manner while balancing the interests of diverse stakeholders. In striving to be a leader in corporate citizenship and sustainable development, a corporate-level CSR Committee drives the company’s initiatives in the strategic areas of stakeholder relations, environment, health and safety, supply chain and employees. Under the umbrella of sustainability, Shangri-La’s social responsibility programme consists of the two elements of “embrace” and “sanctuary.” Embrace focuses on Shangri-La’s Caring People Project, which aims to promote the highest level of education and health support in underprivileged communities. In sanctuary, the programme concentrates on Shangri-La’s Care for Nature Project, which promotes the conservation and restoration of biodiversity.